We first met Tony Tsitaridis of Firetown, CT earlier this summer at the June 15th 2008 North Haven Police Benevolent Association's 1st Annual Car Show in North Haven, Connecticut. 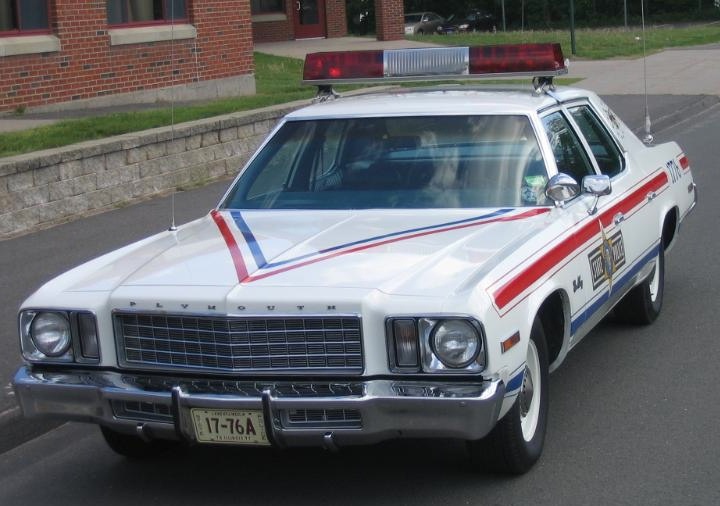 We caught sight of his immaculate1976 Plymouth Gran Fury complete with the Bicentennial Commemorative paint scheme at that show, and thought "This car has to be spotlighted as a "Feature Car" on Policecars.us". Tony is the proud owner of the beautifully restored 1976 Gran Fury you see here as our September "Feature Car". Tony tells us he was looking for a car to “tinker” with back in 2005, and since muscle car prices had already started their seemingly forever escalating climb upward, and out of most people’s reach, he was opting for something a little out of the mainstream collectible such as, as Tony calls them, a “Vintage Mopar Land Yacht”. “I always preferred the Mopars and had looked for an early 70’s New Yorker. I had a lead on a 383 equipped '68 Newport, but that didn't pan out. Then I came across a 1976 “K“coded (police package) Gran Fury out of North Carolina, which had originated from Virginia from an unknown agency”. This car peeked Tony’s interest due to his exposure to an ex-Connecticut State Police Car his older brother had when he was in junior high school. It was a 1973 Plymouth Fury II, the first year they ran them in Connecticut. The Fury II was a “U” coded (440 c.i) car. “Borrowing" it says Tony, was a little risky for a 14 year old. So Tony decided to purchase the 1976 Gran Fury “Feature Car” sight-unseen; except for a few photos that he had received from the seller. And so, as they say, the adventure began. Tony hopped a plane and took the 1 hour flight into Raleigh/Durham Int'l Airport were he met the seller who had brought the vehicle to the airport with him. “I paid him, filled out the appropriate paperwork and drove the Fury back the15 hours to my home in Firetown, Connecticut. The car's condition was well-worn, but not abused. It was used by its previous owner as a tow vehicle for his boat, and subsequently had been dunked too many times in the local pond”. The rear quarters had suffered from it, but the seller had done an impeccable job repairing them, according to Tony. Aside from the wrong rear end and the missing dual snorkel air cleaner, the car was mostly as it was when it came from the factory. It was painted Chrysler’s “Spinnaker White” and had almost 200,000 miles on it, but according Tony it ran great. “After about 6 months entertaining myself on police car forums on the Internet, my project was decided. The color and lack of body moldings helped secure my decision” says Tony. 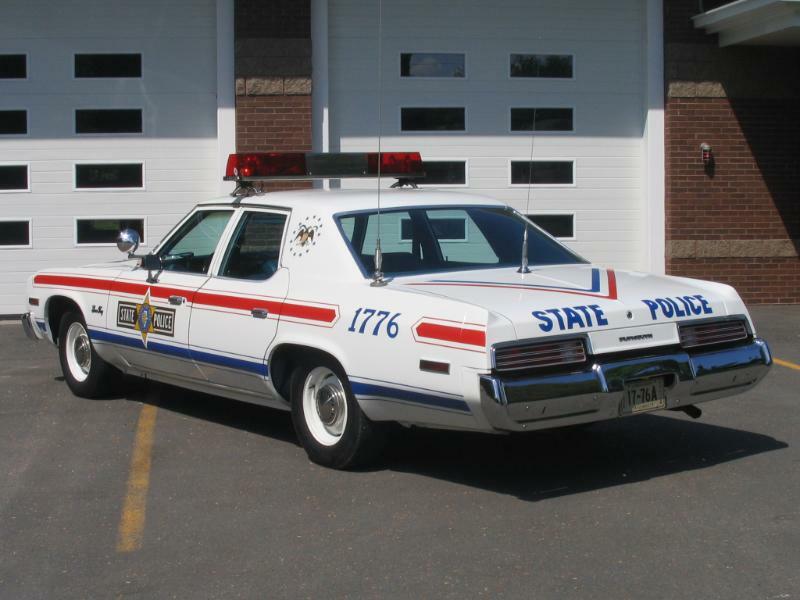 Not only did the Illinois State Police deploy the 76 Plymouth Gran Fury in those days, they took one car for each district and dressed them up in red, white and blue graphics for their Bicentennial Edition in order to commemorate our Nation's birth. 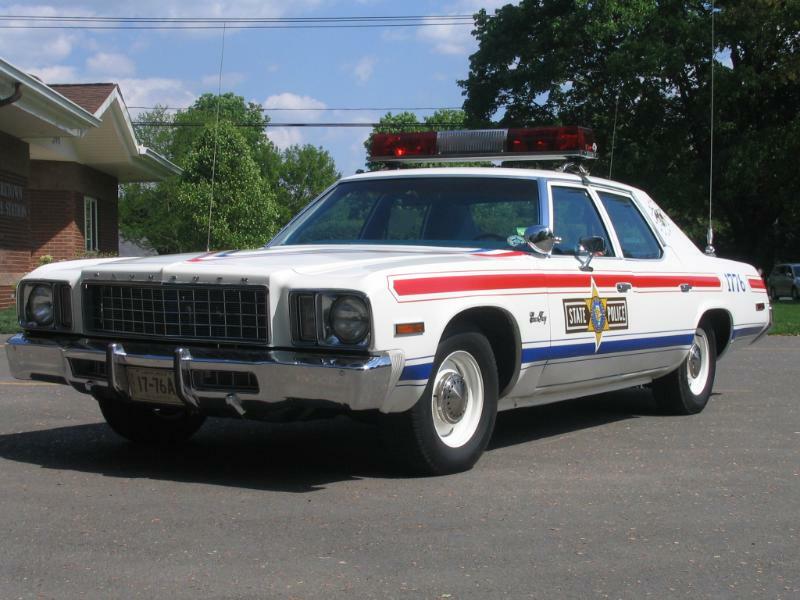 Over the course of 2 1/2 years, Tony researched the 1976 Illinois State Police vehicles to amass the correct electronics and emergency equipment for his car. During this time he completed a multitude of various mechanical repairs and upgrades and acquired both NOS and in his words, “mint exterior components”. He reinstalled and detailed the interior, which included the re-dying of the front and rear seats that he acquired from a donor car. Over the past few months the Illinois State Police special order “Corporate White” color paint was applied and the Bicentennial graphics were purchased and installed. With lots of expert advice from those close to the hobby and personal help from friends and other enthusiasts in the Northeast, Tony was able to complete the project. The Fury's emergency equipment consists of a refurbished Federal Twinsonic model 12X Lightbar, Federal Interceptor PA20A Interceptor Siren, Motorola Low Band with Scan and ISPERN (Illinois State Police Emergency Radio Network) Police Radios. The Federal Signal model 12X Twinsonic lightbar was first introduced at the 1969 International Association of Fire Chiefs (IAFC) in Chicago. The Twinsonic was another industry first in that it was the very first ‘fully enclosed’ lightbar. Prior to the Twinsonic, Federal Signal had introduced the Model 11 Visibar in 1963. The 12 series lightbar included a synchronized flash pattern (70 fpm), an extruded aluminum base frame, a stylish stainless steel speaker housing and a choice of red, blue, clear, or amber domes. The 12X model produced light flashes to the front and rear of the lightbar. This was accomplished with a pair of highly reflective cascading mirrors installed (X-pattern) inboard of each sealed beam lamp assembly. The Twinsonic 12X was available in two lengths, 42 ½” and 54”. The Federal PA20A ‘Interceptor’ Siren, was first introduced in 1967. This electronic siren was the latest introduction from a previous line of sirens beginning with the very first Federal electronic siren, the PA1. The PA5, PA15A, and PA20A were all introduced later, and added enhanced features. 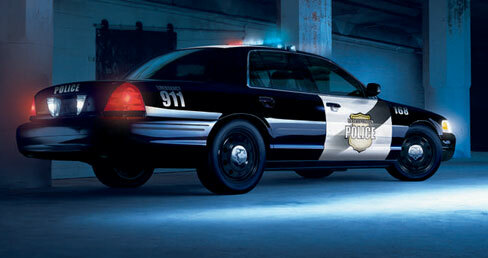 The Federal PA20A Interceptor Siren is rated at 58 watts using one speaker, and 100 watts using two speakers. With one speaker, the PA20A produces 100 db at 10 feet. A second speaker will provide 103 db. A three decibel increase is actually double the power and a noticeable increase in audibility. The PA20A added two features the previous PA15A ‘Director’ did not include: (1) a new siren tone, ‘Hi-Lo’ was added, popular in most European countries, and (2) a plug-in microphone was added. Previously these units were wired-in only. Both the PA20A and the Model 12 series Twinsonic were manufactured at the old Blue Island facility, located at 136th & Western Avenue, Blue Island, IL. The plant was later relocated to the current University Park facility. Tony tells us future upgrades will consist of an engine rebuild, exhaust upgrade, and engine compartment detailing. He is already planning for his next project, a 1988 Gran Fury, agency undecided.